Another month of amazing Brisbane markets await you. This November we welcome Hamilton's new night market, the Eat Street Markets. 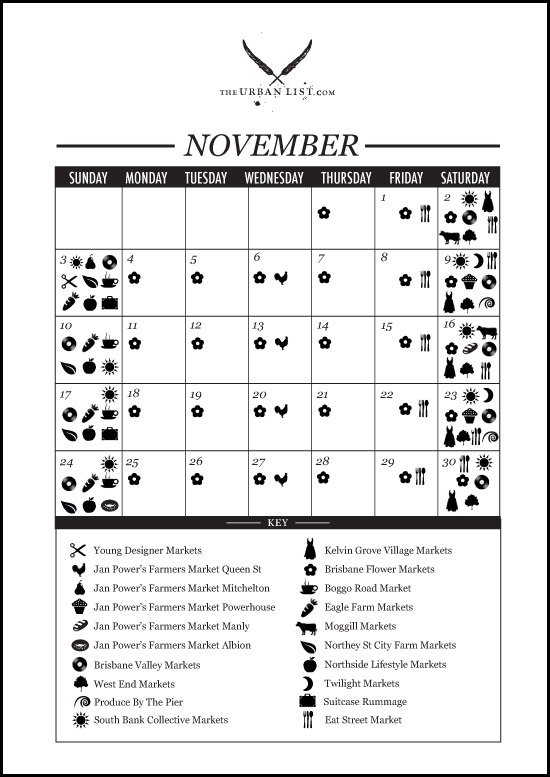 There are now 5 amazing Jan Powers Markets around town, so really you've got no excuse not to go, 'cause there's bound to be one in your hood. Go for the beautiful flowers, freshly baked bread, meats, fish and poultry, and delicious range of stalls unique to each location. Kicking off on Friday the 8th of November, this brand-spanking new night market looks set to shake up the Hamilton Wharf. Running every Friday and Saturday night, this unique market will feature stalls built into shipping containers, and promises the casual feel of an Asian street-food market. The Davies Park Markets are as quirky and eclectic as West End itself, making this markets a must for the curious and experimental market goer. There's loads of fresh fruit and veg, unique fashion and gifts, one-off pieces, and a great range of multi-cultural food stalls and vans. Who doesn't like the idea of trawling through another man's goods to find a special something? Head to the CBD twice a month, and get your hot little hands on books, jewellery, clothes, bric-a-brac, and records, among other recently rejected wares. Great for vintage shoppers. One previously just the stamping ground of florists, the Brisbane Flower Market now sells to the public, as well as wholesale. This massive market has a jaw-dropping amount of blooms, and there are staff on hand to help you choose just the right buds for your occasion. Adored by uni students and locals alike, this eclectic market has something tasty to tempt everyone. With fresh fruit and veg, great food stalls (shout out to Michael's Dumplings, Banneton, and our faves Roost Coffee!) and fashion, this market will rock your Saturday morning. Local designers showcase their wares at the The Valley Markets, filling the Brunswick Street Mall with unique threads, crates of vinyl, and hand-made jewellery. Kicking off from 8am, they are ideal for a wander through with a coffee. Take your shopping bags when you head to Eagle Farm on a Sunday. Organic fruit and veg, gourmet deli delights, and bagels will tempt your taste buds, while the jewellery and fashion will appeal to your sense of style. There are 'Farmer's Markets' and then there are Farmer's Markets. These are the latter. Local producers pull up stops here to sell their wares. Think fruit, veg, and an amazing range of local meats. Lovers of fresh organic produce will be in heaven at this quaint market. Be warned, they shut up shop early, so be sure to get there before 12pm. Once the domain of crims, the Boggo Road Jail now houses an amazing market. Ideal for wandering through, this market has a great range of stalls. Grab yourself a treat and recline in the shade, and that's your Sunday made. Catch the wares of local and up-and-coming designers at South Bank on the first Sunday of every month. There's a fab' array of women's fashion pieces, as well as art, unique homewares, kids designs and furniture. Get yourself sea-side for the Produce By The Pier markets. Think specialty wine, cheese, gourmet meats, and freshly grown fruit and vegetables — these Southport markets are worth the trip. Watch as the cobbled streets of Stanley Street come to life when the South Bank Collective Markets set up every Saturday and Sunday. There's a plethora of art, photography, designer fashion and accessories, homewares, jewellery, pop-up shops, vintage and recycled fashion, and collectables. Because markets are better at night, and even better with beer. West End's Twilight markets have live music, and a superior range of vintage threads and recycled pieces. These markets are a lot of fun. You'll find this family-friendly market on every Sunday in Eaton's Hill. A great range of tasty and tempting food stalls make for a fun and relaxing morning out. And there's even face painting for your small people.